BROOKLYN, Mich. -- Dale Earnhardt Jr. says his career isn't about making money, it's about encouraging and enjoying fame. For a young racer who says he is full of confidence yet wrestles with issues of self-esteem, Earnhardt Jr. knows exactly what he wants. "We definitely have a lot of race fans, and I want more," Earnhardt Jr. said. Although he's not hurting financially, Dale Earnhardt Jr., center, still keeps a tight rein on his winnings. "I want all of the race fans cheering for me.I feel like Muhammad Ali saying that, but I'm not up here hollering that I'm the greatest or anything. I feel like I've got a positive attitude. I feel like I can make every race I run exciting. I feel if I was a race fan, I'd be the guy I'd cheer for because it seems like everywhere we go, something interesting happens on the racetrack." He figures something interesting will happen this weekend at Michigan Speedway. Earnhardt Jr., the 24-year-old son of seven-time Winston Cup champion Dale Earnhardt, is defending NASCAR Busch series champion and will race in the NAPA 200 Busch race Saturday. On Sunday, he hopes to make his third of five Winston Cup starts this season in the Pepsi 400. 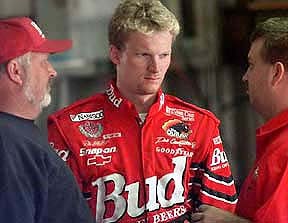 Earnhardt Jr., driving the Budweiser Chevrolet owned by his father, will move full time to the Cup series next season. Should he make Sunday's race, it would be his first on a superspeedway in a Cup car. Earnhardt Jr. made his Winston Cup debut May 30 at Lowe's Motor Speedway in Charlotte, N.C., qualified eighth and finished 16th. He did not finish his second start July 11 at New Hampshire International Speedway because of engine failure. Earnhardt Jr. arrived at Michigan Speedway leading the Busch series standings with four victories in the AC Delco Chevrolet. He has yet to win at the wide, fast, two-mile oval. He was fifth in the 1997 Busch race and seventh last year. In the June IROC all-star race, Dale Jr. and Dale Sr. raced side by side, but youth was edged by experience at the finish. There is no father-son rivalry, but there were many years that young Earnhardt Jr. had to endure the weight of his famous name. If classmates poked fun at him for something his father did in a race, Earnhardt Jr. convinced himself they were just jealous. That fueled him, and it still does when he occasionally encounters professional envy. "I've had to put up with that for a long time before this," Earnhardt Jr. said. "I know exactly how to handle that. I feed off of jealousy. It makes me more confident. It does. When somebody is jealous, that means I must be doing something right. When somebody is envious of what you have, it makes you feel good. When I was in school, there were jealous kids. You learn to deal with that at an early age." He is still dealing with the issues of growing up the child of a famous athlete. Although he praises his father for showing confidence by providing him an opportunity in the Winston Cup series, Earnhardt Jr. also acknowledges his father is tough to please and has never been quick to praise. "I've got self-confidence, but my self-esteem is not overflowing," Earnhardt Jr. said. "I think that's because he's never been one to compliment often. Not that he never does, but -- until you succeed and do something he's done or something he's proud of, you never feel up to par. You never feel like you're playing with a full deck." Earnhardt Sr. was often an absent father. That goes with the career. He credits his wife, Teresa, for raising her stepson, Dale Jr., to be tough and self-sufficient. "She was stern and firm with him when I would give in," Earnhardt Sr. said. "She didn't pamper him and baby him. She treated him like a person. Respected him. Damn if she hasn't rubbed off on him and (stepdaughter) Kelley." The two men have become close in recent years, thanks to a shared passion and career. "I'm going through a lot of the things he's been through, and I'm starting to understand him more," Earnhardt Jr. said. "I feel like we're able to relate to each other easier. We talk more, and I listen to him more and he listens to me more. We're doing a lot of things together, personal and business. He understands more of where I'm coming from, and I understand him, too. "I've got to thank my dad for letting me be my own man. He could be right here calling the shots for me and answering questions for me like he wants me to answer them, but he's not. He's letting me say what I want to say and do what I want to do. That's a tribute to him to let me have that freedom." After all, Earnhardt Sr. remembers what it was like to be Ralph Earnhardt's son. Ralph was a racer, too, the 1956 NASCAR Sportsman champion. Dale Sr. has drawn on those experiences as he deals on a personal and professional basis with his son. "It's really exciting to watch him, to be a part of it," Earnhardt Sr. said. "He's like, Don't worry, dad, I've got it handled.' I can't tell him anything anymore. He knows what it's all about now. I scold him once in a while. I don't think there's a dad who doesn't voice his opinion with his son. But I have to be careful, because I want him to learn. I remember my dad telling me what to do and what not to do, and I was like, Nah.' I'd go do it and learn that what he said was true. I know Dale's not going to believe me until he learns it, so I've tried to give him some freedom, some latitude, and it's worked out well." Tony Eury Sr. has been around the Earnhardts for years. He works as Earnhardt Jr.'s crew chief and said the racing genes run deep. "His personality is a lot like his dad's," Eury said. "Whenever his dad enters a room, everybody knows he's there. And Dale Jr. is the same way. As far as driving, he's as good a driver as his dad. He drives more like his grandfather. He's a thinking driver, a little calmer than his dad. He gets upset in the car, but that's our job to get him calmed down. I don't think his dad was like that when he started. His dad was his own enemy." Earnhardt Jr. says he is still able to hang out with his friends, but that time is limited. During a typical racing season, a NASCAR Winston Cup driver makes about 40 appearances for his sponsors. Earnhardt Jr. already has made 46, and he has 29 to go. He schedules time to himself when he can. Those days are called "Junior Free Days." "The fact I'm young is probably an advantage," he said. "I probably have no idea what's really going on. Everybody's pulling me to be here and be there and do that. There's all kinds of appearances, in Kentucky, Minnesota -- that's part of it. If that starts to get on my nerves, I guess I'll have to think about doing something else for a living, because that's part of this business. "At first I had a hard time dealing with the time that I needed to devote to racing and my sponsors. During the week, I thought that was my time and not for someone to tell me what I should be doing. I realize now that's part of the deal when you sign an agreement with someone." A year ago, he was living in a double-wide trailer near his father in Mooresville, N.C. He now lives in a 10-year-old home. No way was he going to build a big, new house with the works. "I'm very scared to death of spending money," Earnhardt Jr. said. "I don't know nothing about taxes and that (stuff), so if I get a dollar, I don't spend it. I put it all in the bank, because I'm scared to death of taxes and being broke. I just don't want to get in any financial trouble. I don't need anything, anyway. I've got a house to live in, and food is cheap." Earnhardt Jr. has everything he needs. He has talent, he's had success, and he has THE name. "There's a little bit of pressure (being an Earnhardt), but there's so much opportunity and advantage to being in the position that I'm in," Earnhardt Jr. said. "I've got a father who's confident enough in me to make me his driver. Who else would you rather have as your car owner than a guy who's won seven championships? He knows just as well as anybody what it takes to win races. "I feel like I'm cheating a bit, getting in here while the getting is good. (But) we've got to ride this horse while it's running. You don't know how long and how fortunate you're going to be, and there's a lot of examples out there to look at to prove to you this can be very short-lived. I just hope the breaks continue to fall my way."